First, let’s rule out what shouldn’t be a spoiler. Go back, read this book’s description. Comparisons to Anne Rice? A secret club of bloodthirsty men set in the late 1800s London? Within the first fifty pages we’re introduced to a man who stays out all night, comes back with dark red stains on his lips, and sleeps during the day. My question for you: is it really that much of a surprise? Oh, and on the first page of this book, there is a quote with a link to a site that contains an entire book—the most famous and classical of this genre. 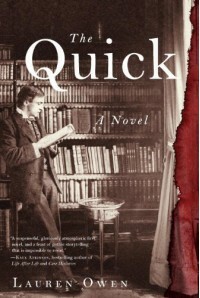 Speaking of the most famous and classical book of this genre (I won’t mention the v-word), THE QUICK reminds me so much of it. Finally! A book of this genre going back to its classical roots: mystery and romanticism. The story unfolds slowly and smoothly. The language employed is perfect and beautiful. There’s a nice mix of narrative and journal clippings. It all blends together to tell a fascinating tale, both classic and new. There are plenty of surprises left to discover. The big surprise is NOT what this book is about, but about how the relationships unfold. This is what I will not give away for you, but let you discover it for yourself. Who are “the quick”? What is “Dr. Knife’s” role? At first, we are witness to the loving relationship of a brother and sister. We see how James, the brother, is reluctant to learn to read, but later becomes a writer and poet. How familial love transcends ordeals and complications unfolds throughout. I also appreciate the mix of historical fiction: meeting famous people like Oscar Wilde, talk of historical figures like Jack the Ripper. That and London itself blend together to enshroud everything with curious mystery. The setting is perfect. Books descriptions are sometimes off in their comparisons to other authors, but they did well this time. The similarity between this and Anne Rice is spot on; even more so with that first weblink offered in this book (author rhymes with Poker). If you are tired of the teen novels of this genre and want something more mature and classic, Lauren Owen offers the winner you seek.